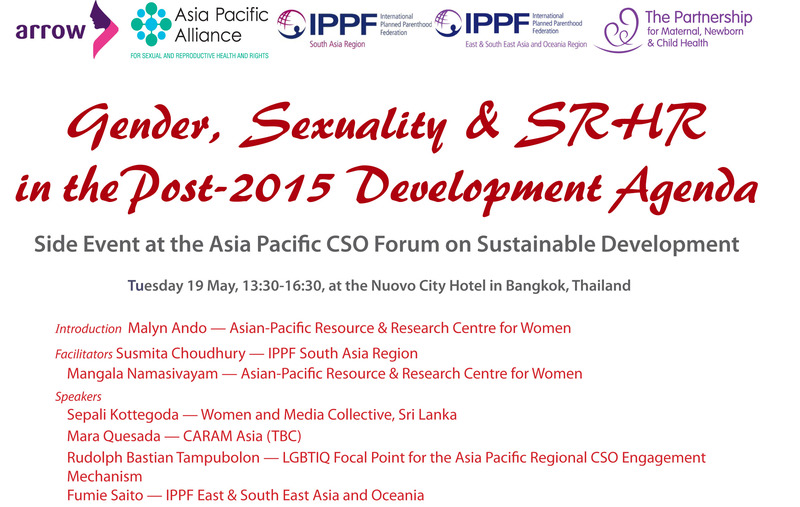 At the Asia Pacific CSO Forum on Sustainable Development in Bangkok from the 18 – 20 May 2015. Women and Media Collective’s (WMC) Executive Director, Dr. Sepali Kottegoda was a panelist at the side event ‘Gender, Sexuality and SRHR in the Post 2015 Development Agenda’. The forum was organised by UNESCAP, United Nations Environment Programme (UNEP), Asia Pacific Regional Civil Society Mechanism (AP RCEM) and APWLD.